This post is sponsored by Viva Italia Days at Publix featuring the best sales on Hunts Tomatoes, Progresso™ Brand Products, Kraft Parmesan Cheese, Pillsbury™ Refrigerated Breads, Betty Crocker™ Cookies in partnership with Linqia. A few months ago, in the midst of holiday parties, Hunter and I met at a neighborhood Italian restaurant for an easy dinner. It was packed to the brim with people, and I overheard a man at the table next to us absolutely gushing about the Tilapia Piccata. I decided right then and there that I must order it. When my meal arrived, it was every bit as good as the neighboring diner had said, but it was a little heavy on the fried side for my liking. I made it my mission to recreate a slightly lighter version of this dish at home. So, when Linqia reached out asking me if I would participate in creating a recipe for the Publix Viva Italia sale, I knew exactly what I would be making. The Publix Viva Italia sale is one for the record books, especially during this cold spell that we're having down south. Few foods are as tummy warming as Italian dishes, and with sales on Progresso Brand Products, Hunts Tomatoes, and Kraft Parmesan Cheese, you'll be able to whip up a great meal for next to nothing. In fact, this entire recipe for two was under $15! And because I love you (and this recipe) so, I am offering a $15 Paypal giveaway at the bottom of this post for you to recreate this meal yourself. Sharin' the Publix Viva Italia sale love, y'all! Heat oven to 200 and prepare boiling water. Add flour to a shallow bowl large enough for your fish filets. In a second size-appropriate shallow bowl, beat the eggs. Add Italian breadcrumbs and Parmesan cheese to a third separate shallow bowl. Dredge fish, one at a time, first in flour then eggs then breadcrumb mixture. The flour will give something for the eggs to hold onto and the eggs will do the same for the breadcrumbs. Heat a large pan over medium low heat and spray generously with cooking spray. Cook fish in pan 4-5 minutes on each side or until the fish is cooked through. Set on a cookie sheet in the warm oven until your sauce is prepared. Prepare spaghetti according to package directions. Add butter and next three ingredients to the same pan on medium-high heat and bring to a boil allowing sauce to reduce 3-4 minutes. Be careful not to burn your butter in this step. 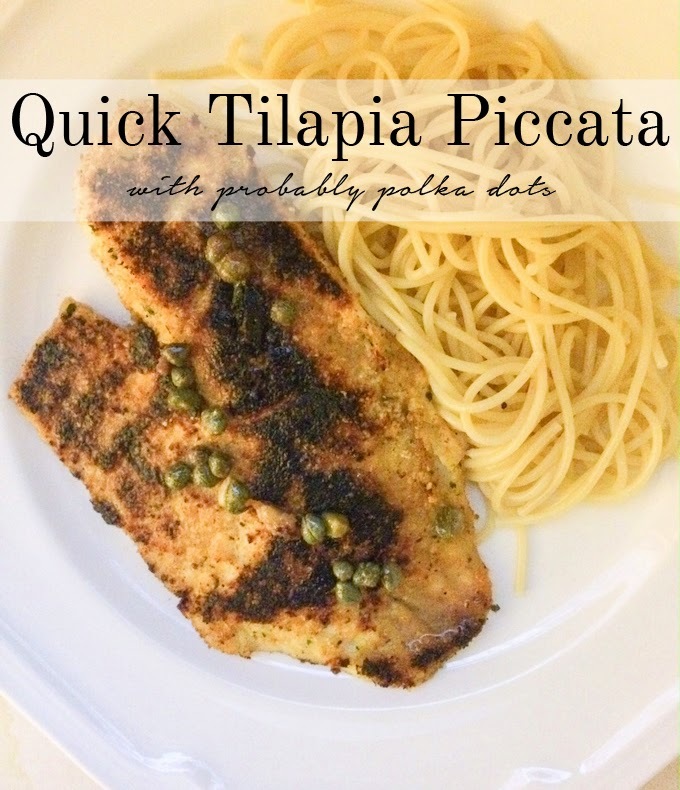 Add capers and spoon sauce over fish. Serve with a side of Mueller spaghetti. Absolutely! You can just swap the flour for GF flour and the breadcrumbs for panko. Let me know if you try it! Um, the fact that you can make those in a slow-cooker is incredible. They're on my list as well! This looks so good. I love tilapia. Id love to try italian sausage stuffed zuchinni! That looks delicious! I love tilapia! I love to try it new ways! I would love to try the baked eggplant parmesan! I would like to try the Hunts tomato and pesto chicken. I'm obsessed with soups this winter, so I'm making Potato Soup with Bacon, Cheese and Broccoli...yum!! Three-Ingredient One-Pot Mac and Cheese! I've never thought of using evaporated milk but why not? thanks for the chance!